Now is a good time to narrow it. To add more, remove at least one or narrow your list. Are you looking for more listings? Please enter your complete email address. We have received your information, so keep an eye out for emails from Cars.com. Toyota redesigned its Sienna minivan for 2011, affirming its commitment to stick it out in a segment other automakers have fled over the past decade. Wider but slightly shorter than its predecessor, the Sienna offers a four-cylinder or V-6 engine and seating for up to eight people. All-wheel drive continues to be offered on the V-6 Sienna, the only minivan to offer that feature. 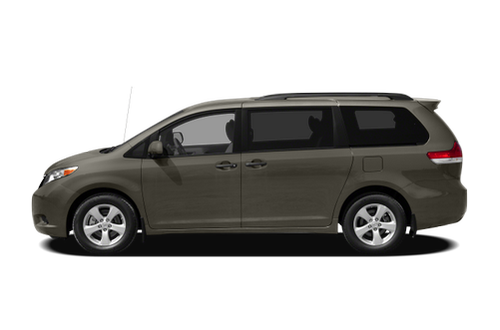 Major competitors include the Honda Odyssey and Chrysler&apos;s twins, the Town & Country and Dodge Grand Caravan. The Sienna comes in five trim levels: base, LE, SE, XLE and Limited. This is the first Sienna generation to offer a sport-tuned SE variant with a firmer suspension, 19-inch wheels and racier exterior details. The SE, XLE and Limited come standard with a V-6, which is optional on the base and LE. All-wheel drive is optional on the LE V-6, XLE and Limited. Changes are minor for the second model year of the current design. A power front passenger seat and automatic headlamps are new standard features for the XLE trim, and the optional rear-seat entertainment system for the SE is now packaged with a moonroof. The Sienna&apos;s styling borrows from Toyota&apos;s Venza wagon, complete with Camry-like headlamps, wraparound taillights and a wide, bladed grille. Each trim level gets a distinct grille, with the SE getting a blacked-out version with a mesh insert. Other SE accoutrements include lower side skirts, clear-lens taillights and 19-inch wheels. Seventeen- and 18-inch alloys go on other trim levels. The Sienna&apos;s dashboard has been designed so both the driver and front passenger feel a majority of the space is theirs, Toyota says. Its swoopy lines convey separate spaces for both occupants, with large dials for major functions like temperature adjustment and stereo volume. Depending on seating configuration, the cabin accommodates seven or eight occupants. Standard second-row captain&apos;s chairs have a walk-in feature that tips up the bottom cushion and slides the seat forward for third-row access. A removable center seat is optional; it stows in a nook behind the third-row seat. The third row folds into a storage compartment behind it to create a flat load floor. The Sienna&apos;s second-row seats are removable, creating maximum cargo capacity of 150 cubic feet. There&apos;s 39.1 cubic feet behind the third row and 87.1 behind the second row. IIHS rates vehicles good, acceptable, marginal, or poor. Insurance Institute for Highway Safety (IIHS) is a nonprofit research and communications organization funded by auto insurers. Have questions about warranties or CPO programs? Which Cars Fit Three Car Seats? How Do Car Seats Fit in a 2019 Toyota Sienna? Like what you see? 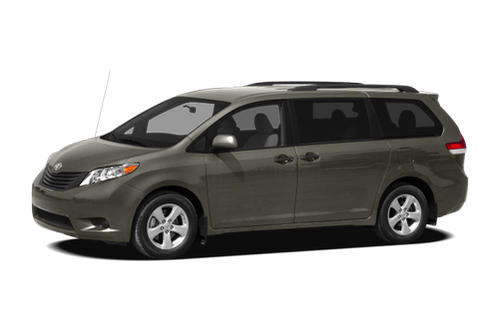 Find the best deal on a Toyota Sienna today. There are for sale near you. * This score may not apply to all trims, especially for vehicles with multiple body styles that affect the space and design of the seating. Often called a basic warranty or new-vehicle warranty, a bumper-to-bumper policy covers components like air conditioning, audio systems, vehicle sensors, fuel systems and major electrical components. Most policies exclude regular maintenance like fluid top offs and oil changes, but a few brands have separate free-maintenance provisions, and those that do offer them is slowly rising. Bumper-to-bumper warranties typically expire faster than powertrain warranties. Don't be misled a 10-year or 100,000-mile powertrain warranty doesn't promise a decade of free repairs for your car. It typically covers just the engine and transmission, along with any other moving parts that lead to the wheels, like the driveshaft and constant velocity joints. Some automakers also bundle seat belts and airbags into their powertrain warranties. With a few exceptions, powertrain warranties don't cover regular maintenance like engine tuneups and tire rotations. What is included in Roadside Assistance? Some automakers include roadside assistance with their bumper-to-bumper or powertrain warranties, while others have separate policies. These programs cover anything from flat-tire changes and locksmith services to jump-starts and towing. Few reimburse incidental costs like motel rooms (if you have to wait for repairs). What other services could be included in a warranty? Some automakers include free scheduled maintenance for items such as oil changes, air filters and tire rotations. Some include consumables including brake pads and windshield wipers; others do not. They are typically for the first couple of years of ownership of a new car. A certified pre-owned or CPO car has been inspected to meet minimum quality standards and typically includes some type of warranty. While dealers and third parties certify cars, the gold standard is an automaker-certified vehicle that provides a factory-backed warranty, often extending the original coverage. Vehicles must be in excellent condition and have low miles and wear to be certified, which is why off-lease vehicles feed many CPO programs. To find the best deals near you, please enter your ZIP code.